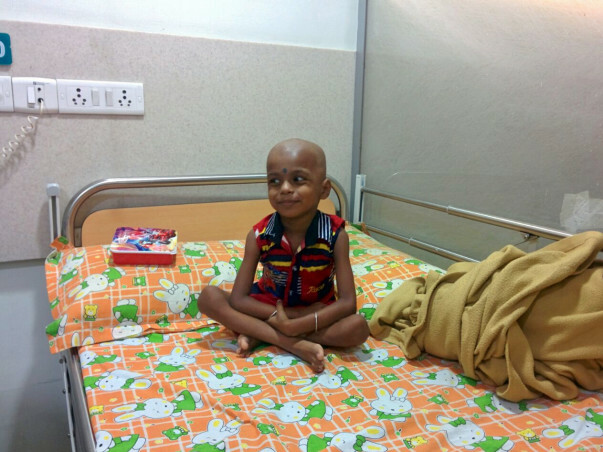 My son, Rahul, is 3 years old and has been diagnosed with Acute Myeloid Leukemia (AML). I am a farmer, and my family and I hail from West Bengal, but are currently staying in Coimbatore, where I work in a restaurant. When Rahul started falling ill quite frequently, we got him admitted at CMC Medical College and Hospital in Vellore. He suffered from fever, stomach aches, and leg pain. We conducted bone marrow tests at least 4 times, but the results were inconclusive. He was prescribed some medication. However, he would fall ill again soon after his round of medications were complete. A friend told s to get Rahul checked by Dr. Revathi Raj at Apollo Hospital in Chennai. Dr. Revathi Raj told us to get another bone marrow test done for our son. To our horror, in June 2015, we found that our son has leukemia. He has undergone a round of chemotherapy, and needs to complete at least 2 more sessions. I belong to an extremely humble background – my family members belong to the farming community. I work in a restaurant and my wife is a homemaker. We cannot afford the cost of the medical expenses. We now turn to you for your support in saving our beloved son. We have sold our land to fund his medical expenses so far, which has cost us around Rs. 8 lakhs. We are facing financial hardships in providing for the rest of the expenses. We urge you to contribute anything within your means to help save Rahul. We spoke to Rahul's father and his doctor. Rahul was brought to the hospital few days back for a regular check up. But we received unfortunate news from the doctor. Rahul's leukemia has relapsed. He is undergoing chemotherapy and is recovering slowly. He has to be in supportive care for 3 to 4 days more. Doctors are waiting for the bone marrow report to decide the further course of treatment. We have transferred Rs 4 lakhs to the hospital for the first session of chemotherapy. The family needs funds for the next cycle of chemotherapy and supportive care. We have increased the target amount to Rs 5 lakhs more to support them. Keep him in your prayers. We will keep you posted in the coming days about his progress. Rahul's father has asked us to share this message with you all. Thank you all for your support. Rahul is doing well now. We were on the verge of stopping his treatment, when like 'God opened his eyes', we started getting suppport from you all. I feel so happy that to save my son, so many people from across the country and world came forward to help. From the bottom of my heart, I thank you all. May God bless you. The goodness in your heart that made you help my son will return as blessings to your children and family. If I get a chance, I wouldn't mind vising each of you to express my gratitude. I would like to thank Akki Reddy who transferred the funds (over 6 lakhs) collected for his son, Badri, who passed away unfortunately. Thank you sir.